The brothers closed the business and went their separate ways. Both ended up working for a number of years in the automobile industry in nearby Windsor, an automotive hub. However, Ben Klundert was only waiting for the right moment to return to his love. He formed Ben Klundert & Son Contractors Ltd. in 1987 and, for almost 20 years, has never looked back. To be sure, BK Cornerstone is building homes, even when many other builders in the area are facing tough times. The company has between 15 and 20 homes on the go at any given moment. It’s very much a family business. Klundert’s wife SUE and son BRENTwork for the company. Brady, 34, is a full partner in the business and his wife TAMMYworks parttime at the office. 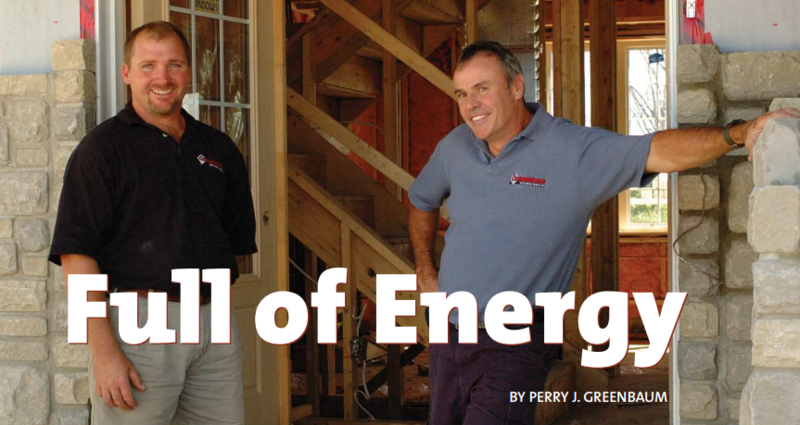 One of the company’s noted ventures is the EnviroHome project that it is building in Belle River, the first such project in Essex County. Once completed, the 1,900-square-foot, twostory house, which sits on a 60-foot by 121-foot lot (7,260 square feet), will have a market value of $300,000. A 1.2-kilowatt solar array consisting of eight solar panels to generate electricity. An in-floor hydronic heating system for basement radiant heat, which uses a combination heat source — natural gas boiler and solar hot-water heating. The latter consists of Energy Pack and two solar collectors. Main floor supplemental heat is generated from a dual-stage natural gas furnace with an ECM-DC driven fan motor. The furnace is rated at 95 per cent energy efficiency. Supplemental heat also comes from two 4- ft x 7-ft solar sheets on the south side of the building, attached to solar-driven fan motors for air distribution.